OPTOS VS DIGITAL RETINAL IMAGING (DRI) AND DILATION Some eye doctors are touting the benefits of Optos as a diagnostic instrument to capture retinal imaging and as a way to AVOID being dilated. The problem is that 1) Optos does not capture the true image of the Retina and 2) Optos does not capture 100% view of the peripheral retina to detect retinal tears that can lead to potential retinal detachments! As such, it is no substitute for a dilated exam! The image on the left is from Optos. 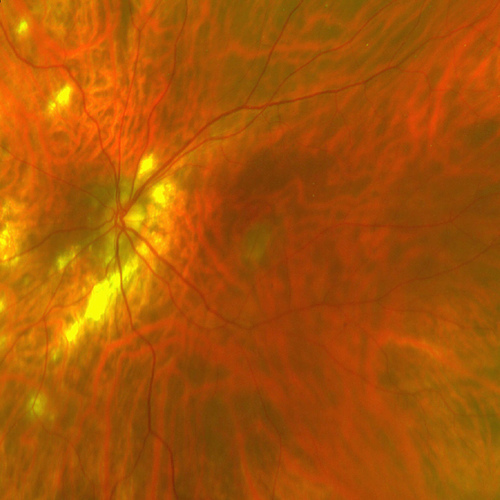 There are several reasons this is a Poor Diagnostic Tool, in our opinion:The picture is FALSE color composed of just red and green only (just 2 colors) As such it is hard to correctly interpret.The picture is LOW resolution, compared to DRI, Digital Retinal Imaging (as you will see below). The yellow spots do not exist but are an artifact of the false color image. In contrast Digital Retinal Imaging and Dilation of the eyes allows Dr. Ross and Dr. Desai to capture 100% view of the retina and obtain a natural magnified view of the blood vessels to detect early signs of hardening of the arteries! 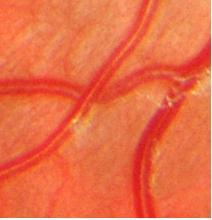 The image on the left is a DRI image, taken at our office.Notice that it looks just like it is in a biology text book. The colors are real and the details are sharp and clear! What is even more amazing is this can be magnfied many times over and not lose much sharpness! Because of this we can diagnose health problems that Optos will miss! Notice on the left how easily DRI shows details of blood vessels that would be very poorly seen in Optos! This helps us warn patients of possible strokes or heart attacks! We recently saw a patient who, when at another optometrist had an Optos test. The doctor said the results came out fine. The dilated retinal exam, with Dr Desai, revealed she had thinning of the retina that could lead to a retinal detachment, and she was sent to a retinal specialist for laser treatment! For this reason and many more we do not recommend the Optos test. History Of Optos: The inventor had a family member who suffered a retinal detachment, and then decided to see if there was a way to prevent it without dilating the eyes. 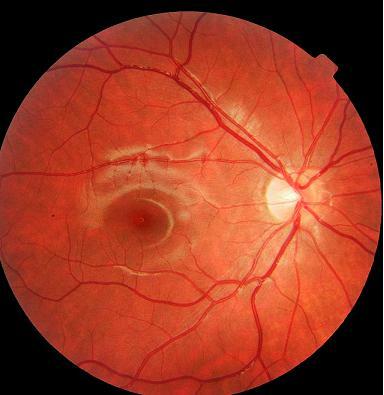 The Optos never could see the far retinal periphery so it failed as a tool to replace dilation. However, as with most inventions that had millions of dollars spent on it, they found a use for it. They now “give” the Optos Machine away free to chain stores and other doctors who share the fee with the manufacturer for each test they do. They also require that the Optos renter do a certain number of tests each month or they charge the person who has the machine! Optos can detect disease but far better is DRI and getting dilated. Optos is NO SUBSTITUTE for dilation and don’t let anyone tell you otherwise!